This article about New Utrecht Reformed Church appeared in the New York edition of the New York Times on Monday. It was written by Rick Rojas. View the article on the Times website — which includes more photos — by clicking here or read it below. The stone church has been in Brooklyn for almost 200 years, and it was easy to tell. The floor creaked under worshipers’ feet as they made their way to a pew, and a plaque in the vestibule commemorated past members who had fought in the Great War. Many who gathered for a recent Sunday morning service had been part of the congregation of New Utrecht Reformed Church for decades. Still, as they sang and prayed and wandered the aisles to offer peace to one another, many felt like they were acclimating themselves to the sanctuary. They had been locked out for some 15 years, as a renovation project swelled into an epic overhaul. They have only been allowed back inside to worship in recent weeks. “Welcome to God’s house,” the Rev. E.J. Emerson, the church’s pastor, said at the start of the service. The sanctuary was new to her, too. She had arrived six years ago, and until now, the space had been filled with scaffolding and tools. She had led services in a hall next door. Bensonhurst, the neighborhood that surrounds the church, reflects the churn that has defined parts of New York City like this one for generations, as new arrivals imported traditions from home. On the streets nearby, there is an Italian deli and a store specializing in Mexican and Central American fare, and there are many signs etched with Chinese characters. New Utrecht Reformed Church, with its sprawling green lawn in an otherwise packed urban setting, is a relic of an even more distant past, summoning a time when the area was a village and congregants were largely farmers. As the neighborhood evolved, the church was a constant presence. And now there is hope that by opening its doors again, the sanctuary can help secure the congregation’s existence for at least one more generation. “We just felt we had to be in this building,” Pam Ander, a congregant who helped oversee the renovation, said. The congregation was established in 1677, only a few decades after the Dutch settlement of Brooklyn started. At the most recent sanctuary, which was built about 190 years ago, the aging roof had started to sag, deteriorating to the point where safety became a concern. The renovation included replacing cedar shakes on the roof and figuring out a more affordable way to restore the barrel-vaulted ceiling. The building is designated as a city landmark and is on the National Register of Historic Places, which helped qualify it for state grants to fund portions of the $2 million project. Still, the church had to fund-raise and sell its parsonage to cover costs. The work is not finished. Netting hangs behind the altar, where the organ alcove will remain undone until more money can be raised. Part of the motivation for the overhaul was to preserve the church and its grounds, which offer a rare artifact from Brooklyn’s earliest days. Only a few landmarks remain from hundreds of years ago, when New Utrecht was its own town, said David Elligers, president of the Friends of Historic New Utrecht. “We believe in this history and in the importance of this building,” he said. The grounds include the Liberty Pole, a monument near the sanctuary with a history dating back to 1783, marking the departure of British soldiers. And there is the cemetery, filled with well-known monikers — Nostrand, Ditmas, Van Brunt — so old they are more associated with streets and neighborhoods than the families who lent their names. “We’re lousy with history,” one congregant, Susan Hanyen, said of the abundance. Yet for Ms. Hanyen, the effort was about more than history. The church, in her mind, was not a museum. 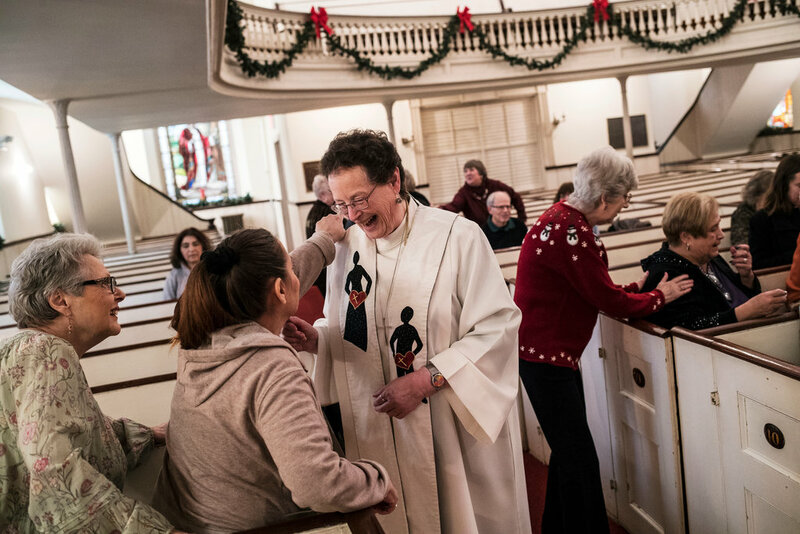 Her aim was sustaining a congregation that has endured for 341 years, but has arrived at a challenging moment: It is aging and dwindling, and now has about 40 members. The crowd at Sunday services has been mostly the same for decades. The decline, she said, could be attributed in part to the years spent worshiping in the church hall, which perhaps turned off those who sought a more traditional experience, with pews and a towering ceiling. The church has had pet blessings, bake sales and, recently, a live nativity with farm animals to draw neighbors inside. “We need to get young families,” she added. The hope is that the restored sanctuary will lure them. Pastor Emerson said church is about more than a physical structure. “It’s the congregation,” she added, “the people, the presence of God’s spirit.” Even so, she could not help but be impressed the first time she climbed the steps to the pulpit. She sensed the history surrounding her. No more than two dozen people (and one longhaired Chihuahua named Princess, a regular attendee) assembled for the recent Sunday service. They did not come close to filling the church, which could hold several hundred people with its rows of pews and horseshoe balcony. They sang “Joy to the World,” and Pastor Emerson gave a sermon warning the worshipers of darkness in the world and called on them to be a source of light. Then she solicited their intercessions. One by one, congregants listed off coming medical tests, a son-in-law’s dire health situation, a request for help settling into a new neighborhood. She jotted them all down. A soft light bled through the stained-glass windows and flooded the church as she stood at the pulpit and led her congregation in prayer.